This is the journal developed by Dyan Reaveley from Dylusions and is said to be specifically suitable for using the Dylusions spray inks with. I bought the large size a while back to do some Life Book lessons in, and more recently bought the smaller one as it fits nicely in my handbag and was also on the supply list for Art Journal Summer School. 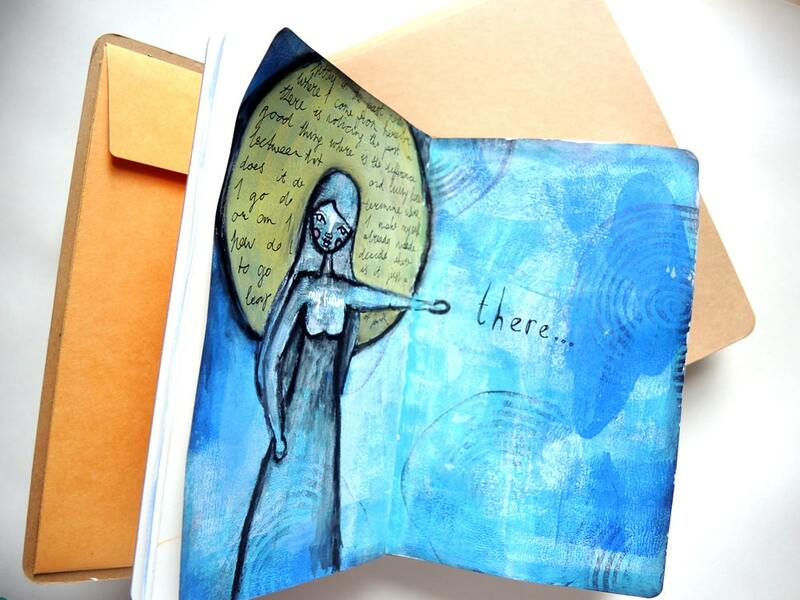 This is a very pretty art journal. A lot of thought has obviously gone into the design. I love the brown cover and the way it has an elastic strap to keep it closed. It also has an envelope inside to keep small bits in. The cover is separate from the ‘notebook’ that is actually glued inside. This means that you can open the journal flat rather than having to bend the spine. In the big version of the art journal I’ve had some issues with the binding with the area of paper near the spine getting quite weak (& tearing) when the paper is wet. There is bleeding through to other pages if you use wet media near the spine. The large version comes with two types of paper (the signatures alternate between the different paper types): manila cardstock and matte white heavy cardstock. The smaller journal has the white cardstock throughout. The paper is nice and smooth. When turning the pages you get a feeling they are quite thin. I like to work with a lot of wet & heavy media and I don’t feel the paper is quite a match for that. Especially in the bigger journal the pages are prone to tearing near the spine if you use wet media. 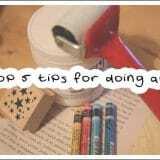 The paper is also prone to pilling if you don’t use a layer of gesso or acrylics beforehand. This journal is fairly unique in that it has good availability both in the US and the UK. Hurrah! The price is reasonable but not cheap. I feel like you’re paying over the odds to get a nice design and the Ranger/Dylusions brand name, but the overall quality could be better. The smaller journal feels worth it to me, but the bigger journal is expensive. If you’re in the UK and looking for an A4 journal I’d spend the extra £8 to get a Roberson’s Sketchbook instead. The elastic band is prone to snapping. This has happened to my big journal and I’ve heard a lot of people mention the same thing. It’s not a big deal, but it does feel like a design flaw seeing as it seems to happen to a high percentage of journals. If you’re a very heavy mixed/wet media user then this might not be the journal for you due to the paper not really holding up to it. For more light mixed media use this is a good journal, and the paper does make the Dylusions inks look nice and bright. I’d rate the big journal slightly lower (more like a 6.5/10) and I won’t be getting another one of those. I will most likely get the small journal again. Disclosure of Material Connection: I have not received any compensation for writing this post. I have no material connection to the brands, products, or services that I have reviewed. 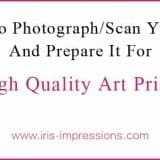 This post contains affiliate links to art courses that I recommend. If you’ve used the journals yourself and would like to share your opinion please do leave a comment below! Dear Iris hi! 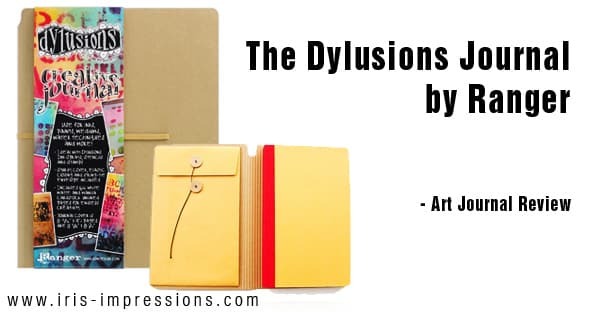 Thank you for your Dylusions Journal review, it is quite informative! 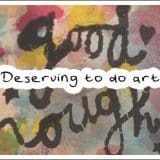 I do too LOVE art journals (I love all kinds of notebooks and diaries too, it must be something with the paper that I can’t explain!). 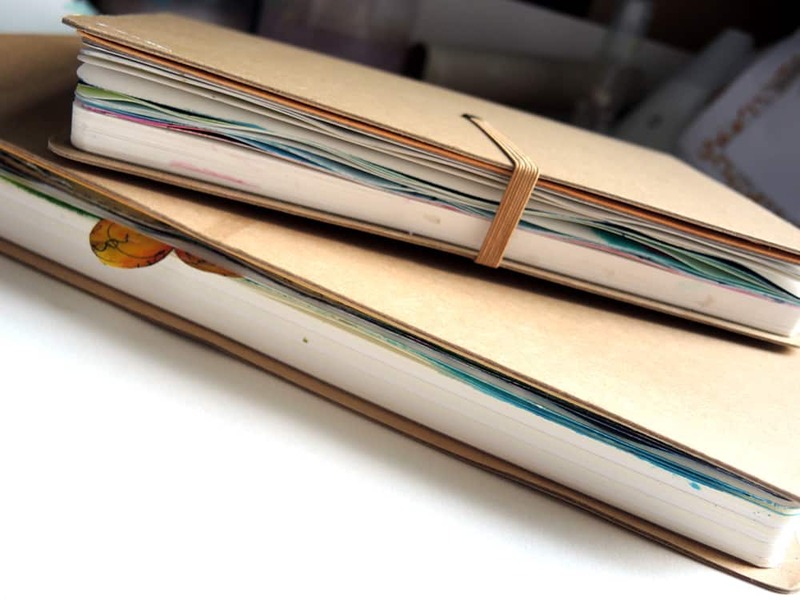 I even love making them myself and, although, I haven’t finished my first BIG handmade art journal, I’ve bought a small Dylusions Journal as I needed something smaller than the one I already had, with nice paper and which was easy accessible to me. I found the price of the small Dylusions Journal at $14.99 quite reasonable compared to other journals or sketchbooks that I could buy here in Greece. I haven’t work on it yet to have an opinion regarding its paper quality but from its feeling to the hand I think it is a little bit thinner than 300gsm watercolor paper and quite smoother. I intend to use it mostly with paints that don’t need a big amount of water in order to prevent it from tearing or bleeding, as I really like its design. Many greetings from Greece! Hi Iris, I recently bought the large Dylusions journal here in Canada. Mine only has one kind of paper – the same kind as in the small Dylusions journal. I wonder if there are different versions of the journal. Thanks for the review! I’ve purchased three of the small ones over the past year. On two of them, the elastic band (one of my favorite features) snapped within days of first use. I politely contacted Ranger and they said they wouldn’t replace them. 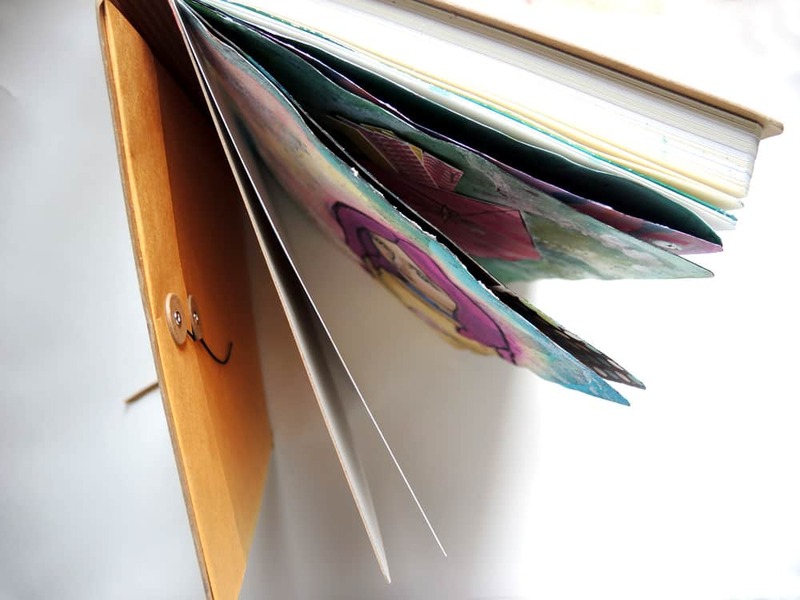 They consider the journals still usable because the customer can still put a rubber band or ribbon around it to hold it closed. I don’t think I’ll be buying more of these :). I use both the large and small all the time. They are my favorite journals to use. I use all kinds of media on them with no problems. 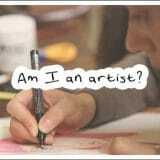 I do acrylic… watercolor… mixed media… and others. I could care less about the elastic band breaking… I just put a bright colored hair band around it. No big deal…. The newer journals fo have 2 kinds of paper where the older have only one kind. I do like my older one a little better and bought several before they would all be gone. I have never had one tear …. and to keep fluid from seeping thru which happens in any journal that I have used otherwise I just put a piece of washi tape down the seam. I give this journal a big 10!!! !